[…] Those familiar with the current draft of the agreement say that it speaks of the establishment of 400 US military sites and bases through the country, of legal immunity for American troops and citizens, and an abrogation of any undertakings previously made, to share in the reconstruction of the country. Here’s my question: if the Iraqi government — under pressure from, say, millions of demonstrators in all major cities — ends up rejecting the agreements, what then? Is it possible that in the end it’s not the next U.S. president who decides whether to draw down American forces, but — gasp — the Iraqis? 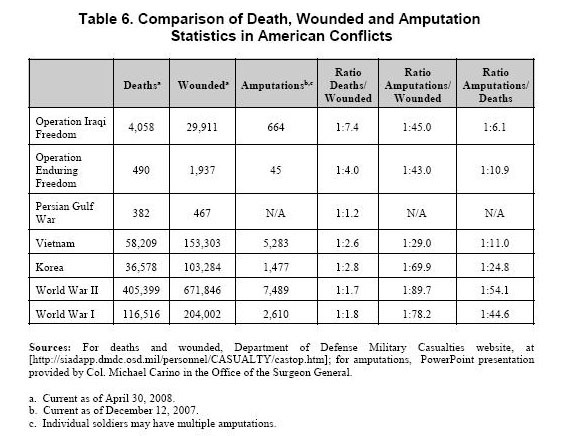 Thanks to modern military medicine, more soldiers’ lives have been saved in Iraq than in any other conflict. The downside is that the number of KIA no longer reflects the brutality of war — or its social costs. In other words, it’s the number of wounded we should be focusing on. How will Iraq end? Probably not with a clear-cut victor. It will probably end a draw. The U.S.-led coalition of the willing posted a huge first-innings score of 568 and followed it up by arrogantly fielding exclusively fast-bowlers and allowing the enemy to post a 367 in their first innings. (We must have thought we were the Windies c. 1982.) We then collapsed for a 97 in the second innings and are now desperately trying to hang on for the win in the enemy’s second innings. He might win. So might we. But at least we’ve got some spin bowlers on the field now. Thanks for everything, Abu Muqawama. After the widely advertised government “crackdown” in Mosul, things are returning to normal. The lesson, in caps: YOU DO NOT ELIMINATE AN INSURGENCY BY MASS DETENTIONS. Al-Qaeda on the ropes, contd. The debate over al-Qaeda’s troubles continues over at Jihadica, where Will McCants and Michael Scheuer engage in polite discussion on exactly how serious this thing is. There is something to the recent meme that Scheuer is missing: these attacks from former prominent supporters or fellow travelers are severely damaging the publics’ opinion of AQ, especially among educated Salafis. The books or letters written by Awda or Sayyid Imam are carefully formulated criticisms of AQ from within the classical Islamic tradition, not silly there-is-no-violence-in-jihad arguments. I think the point I tired to make is that the recanters are just defeatists. Their recanting may be sincere, but it protects the status quo and offers no hope to those dissatisfied with U.S. policy and its impact, or those who are weary of Arab tyrants. The one thing that I am certain was not a mistake was to liberate the Iraqi people from Saddam Hussein. This is what’s called the WYPMC (“Would You Prefer the Mushroom Cloud”) argument, which the Bush White House has developed from the age-old WYRYWWR (“Would You Rather Your Wife Was Raped”) argument so successfully used by gun nuts everywhere. So, is al-Qaeda about to go nuclear or what? Probably not, but the media debate has been entertaining. Jihadica, as always, provides good commentary on the chatter on jihadist web sites.